This is elk stir-fry recipe is simple and packed with fragrant and subtle hints of orange and ginger. Serve with steamed rice, broccoli and green onion. Tastes just as good with venison. Cook rice by following directions on package. Cut elk roast into 1/8-inch thin slices and mix in the orange zest and set aside. In a small bowl combine the juice from one orange, Tamari or soy sauce, rice wine vinegar, dark brown sugar and cornstarch. In a large skillet heat canola oil over medium-high heat. Working in batches, add elk to the pan and cook pieces until golden brown about 60 seconds. Turn and repeat process until meat is cooked. Remove from pan and set aside. Add garlic and ginger to pan and sauté for about 2 minutes . Pour sauce into pan and bring to a boil stirring frequently until sauce thickens. Add elk to the pan and coat in the sauce. Remove from heat. 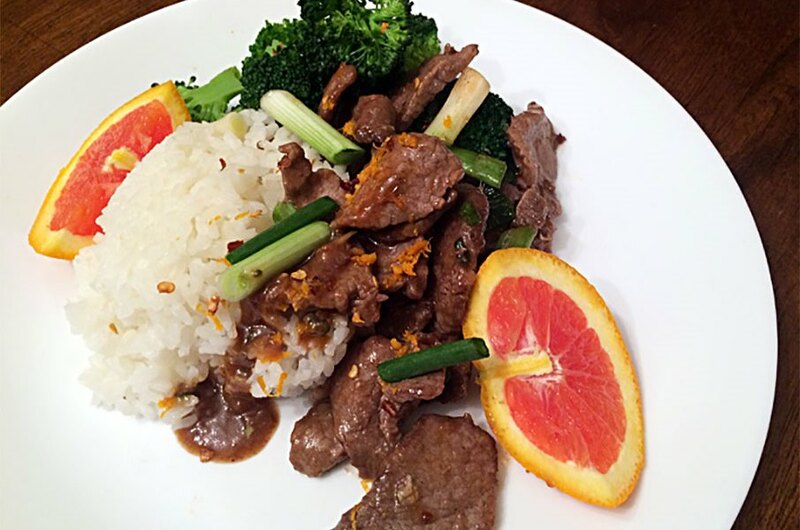 Serve orange elk with rice, steamed broccoli and chopped green onion.